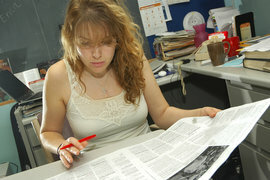 Erica Hendry '09 editing "The Ithacan"
Considered "the Pulitzer Prize of Collegiate Journalism," the Pacemaker is awarded by the Associated Collegiate Press. The Ithacan has been nominated for this prize seven times and has won four times. The Ithacan has also won the recently created Online Pacemaker award for the past two years in a row. The New York Press Association has honored the Ithacan with this award eight times in the past nine years. 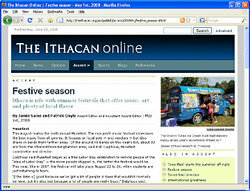 The Ithacan has won the Apple Award for Best in Show at the College Media Advisers Spring National College Media Convention in New York five times , including the last three years in a row. It’s the end of my first week of classes at Ithaca College, and I’m sitting in the Park Hall Auditorium as an unsure but hopeful freshman intrigued by the romance of newspaper journalism. And to be honest, I didn’t have an answer as to why. Like so many first-year journalism majors, in high school I had been told my writing was “wonderful.” I had won a handful of essay competitions and reported for my hometown newspaper, and majoring in journalism just seemed like the logical next step. That’s how I found myself at a recruitment night for the Ithacan, the College’s campus newspaper. The thing that struck me about the Ithacan was that it was real -- these were students who really got it, who set themselves up to meet the same standards as any other newspaper, who trained themselves by pushing each other and pooling each other’s strengths. Former "Ithacan" editors Anna Uhls ’07, now at the "Washington Post," and Matt Quintanilla ’07, now on staff at the Minneapolis "Star Tribune"
I became a news writer. One of my first stories was following the trial of students who had been arrested in a weekend fight in the Circle Apartments. It was only my third time coming into the office and talking with the editors, but they decided to assign the story to me anyway. I’ll never know what made the editors trust me with that story given my inexperience and unfamiliarity with how crime stories work, but I knew enough not to ask why. I remember driving to the town of Dryden court on a Tuesday night with a photographer. The hearing was in a small room of the courthouse: the judge at a center table, the three student defendants and their lawyers in front of him -- and me, awkwardly sitting in the back corner with a tape recorder, a borrowed pencil, and a brand new notebook. The decision to give me that story is the kind of decision student editors make every day -- and they aren’t just made by seniors. I was assistant news editor as a first-semester sophomore, news editor by my second semester, and editor in chief this year, as a junior. There are two freshmen on this year’s board. Seven seniors, many of whom have spent multiple years on the board, are about to graduate. It’s the perfect balance of fresh perspective and aged experience, and the majority of the learning we do is from each other. We publish every week in print and every day online. In a community of 5,000, that’s not easy. You learn quickly that deadlines are fast and real. In class, you can submit a paper by e-mail one day late and still get a decent grade, but try the same with our printing press and you’ll be empty-handed in the morning with a complimentary late fee. You’ll also learn that things don’t always run smoothly. During the first week of classes last year, two deans announced they would retire in May. Combined with summer announcements of resignation and retirement from a dean and president, these departures brought the total number of outgoing administrators to four. The newsroom was a blur of notebooks, highlighters, and calls made way too close to deadline. It came to a halt as we sent the last page to the printer -- at 4:30 a.m. Not every week is like that, though I can safely say I’ve invested more time in the office (and more money in Dunkin’ Donuts) than I ever thought possible. But underneath the news cycle, deadlines, and lost sleep are the benefits: the rush that comes with breaking a story to campus; hearing students and faculty on the quad or in the halls engaged in conversation about an article; exceeding expectations with new ways to tell stories with audio and video. What has been the most rewarding, though, is creating a dialogue in the community and prompting change, which we’ve had countless opportunities to do this year. There are groups working to form new policies about campus safety after our coverage of sexual assault; an increased awareness of poverty in Tompkins County after our coverage on homeless communities, and a community-wide conversation started by our coverage of the College as it selected two new deans and a president. And then there are the job opportunities: Vanessa Schneider ’07, Anna Uhls ’07, Matt Quintanilla ’07, some of my first and most inspiring editors, are now employed by the New York Times, the Washington Post, and the Minneapolis Star Tribune. These were their first jobs, straight out of college -- and straight out of the Ithacan. Can you get that kind of experience in class? The truth is, no. In class you’ll learn how to write crime stories, how to interview people, and how to research trends. But you don’t get to respond to these kinds of situations as they happen outside of the vacuum of a classroom environment. If you dive into any section, in any capacity when you get here, chances are you’ll become an editor -- if you want it. The harder part is trying to leave once you realize how much you love it.